« An American Tragedy, the novel and the films. Their Finest, Britain, Sweden 2016. This was a BBC project which enjoyed Stephen Woolley as a key producer and recruited Lone Scherfig as director. 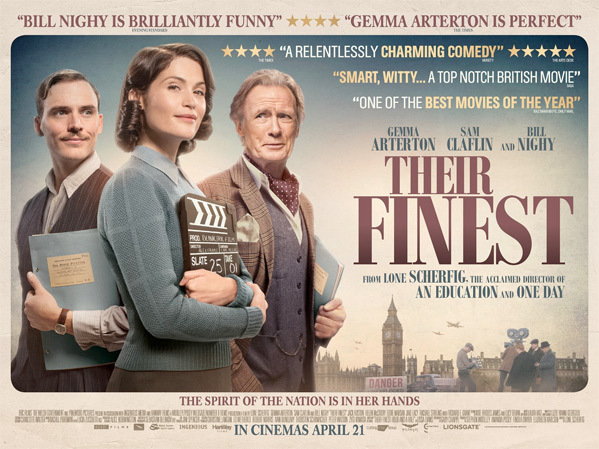 It was adapted from the novel by Lissa Evans, ‘Their Finest Hour and a Half’, by Gabby Chiape. Stephen Woolley has written on the background to the film in Sight & Sound (May 2017) and there is also an interview with Lone Scherfig in this issue. All of them bring their particular talents to the film. This bears the hall marks of the BBC, both in the reconstruction of wartime Britain and in its particular sense of British values, from the 1940s and the C21st. Stephen Woolley appears to have spearheaded the research into the British film industry of the 1940s, which is the setting for this comedy/drama. Lone Scherfig shows the skill with actors that she demonstrated in An Education (2009) and the combination of comedy and drama that graced the earlier Italian for Beginners (2000). Gabby Chiape has previously written for television, [including ‘East Enders’] and whilst this is a big-screen film the interactions have a familiar tone found in a certain area of television. The production values are excellent, notably some fine cinematography. Set in 1940 the film follows the career of Catrin Cole (Gemma Atherton) when she is recruited to provide ‘women’s’ dialogue’ for feature films. She is recruited by the Ministry of Information and then placed in a commercial film company charged with producing ‘propaganda’ that offers ‘authenticity and optimism to inspire a nation’. The brief is also to feature stories about ordinary people including women. Catrin interviews two sisters whose exploit [exaggerated] provides the pitch for a drama around the Dunkirk Evacuation. Catrin works with two experienced writers in a small office near Wardour Street. Their impresario is clearly modelled on Alexander Korda. The lead writer, Tom Buckley (Sam Caflin), is worldly wise in the ways of the industry. Their narrative becomes a ‘film within a film’, The Nancy Starling. The cast are filled out with the members of the film production and Whitehall mandarins who are overseeing the project. There is a substantial role for Bill Nighy as Ambrose Hilliard [‘Uncle Frank’ in the film within]. Richard E. Grant and Jeremy Irons both have sequences where they deliver the rhetoric of the period with aplomb. And the latter adds a ‘yank’ to the film, Carl Lundbeck (Jake Lacy) seconded from the RAF where he has volunteered as a fighter pilot. Carl has to be given acting lessons by ‘Uncle Frank’ but his presence means that the film will receive US distribution and is shot in Technicolor. The pre-production sequences where the script emerges and the writers are embroiled in the departmental wartime politics work well. The productions sequences, with a film directed by a documentary filmmaker, capture the technical and conventional aspects of 1940s filming. And the ‘film within a film’ nicely parallels the developments in the actual feature. The emphasis in the feature is on the writing aspects of film. The film production within this feature uses some settings with visual interest and also with humour. So there is a wry joke regarding ‘Uncle Frank’ and special effects: and a later one whilst shooting a scene in the studio water tank. As well as the ‘ham’ US actor there is [predictably] the rescue of a cute dog. However, there is much less attention paid to the film crafts people than to the writers. Thus the film is supposed directed by someone from the documentary film movement, but we never get any sense of this character. And this applies to the technical people such as cinematographer or sound engineer. And there is no real focus on the editing of the film. What we do see is a visit by Catrin to a cinema where she watches [in a series of brief clips] the finished and distributed film. The audience at the screening are clearly both involved and entertained by the feature. We watch, in particular, the climax and ending of the film. By this stage we know that finally Catrin has been able to write in a sequence in which one of the sister performs a ‘heroic’ act. And we know that she has written the ending for the film after US distributors thought the original ending to ‘tame’. This is the only part of the film that we see that has a documentary flavour. With a voice over by one of the characters, intoning the message of continued struggle and US support, there is a long shot of a couple seated on the harbour wall in a small port in Devon. [Actually shot in Pembrokeshire]. We have seen this shot earlier; it is in reality a test shot before the actual filming and is of two of the key characters in the feature itself. This precedes a final sequence where we see that Catrin has succeeded in becoming part of the established film writing team. This ending takes on a special emotional feel because of development among the key characters in the feature’s story. Whilst the ending of a ‘film within a film’ provides a suitable war-time feel of ‘authenticity’, with ‘optimism’ in the commentary, the knowledge we have about this couple adds a real poignancy to the feature film’s ending. The shooting of the film within a film in Technicolor is well done and enables the film to be predominantly in colour. Less happily we see extracts from 1940s films, [including the production in this feature] projected for viewers in Academy ratio and then [as clips] in reframed in the 2.35:1 ratio. I find this distracting and unnecessary; presumably the BBC was looking forward to television screenings. But I was also undecided just how well presented is the supposed 1940 film. In his article Stephen Woolley lists a number of British productions from the period that he and colleagues studied in order to gauge style and content. Most of these are familiar titles such as The Foreman Went to France (1940) or ‘Pimpernel’ Smith (1941): but there are also lesser known features such as Tomorrow We Live’(1944). This feature is placed in a period of transition from the 1930s style, frequently relying on conventional techniques and lacking authenticity, certainly in terms of working class characters, to the wartime ‘documentary influenced’ approach epitomised in a film like Love on the Dole (also 1941).. The Technicolor films that spring to mind are those of Michael Powell and Emeric Pressburger, later and a long way from either the feature or its film within. And there is an uneven tone, notably in the acting. Bill Nighy has been critically commended but I found his ‘Uncle Frank’ stagy for any sense of authenticity. This may be deliberate by the filmmakers,, but it left me unconvinced by the audience response in the cinema to this film within. This entry was posted on April 27, 2017 at 7:29 am	and is filed under British films, Films by women, Literature on Film. Tagged: Women and film. You can follow any responses to this entry through the RSS 2.0 feed. You can leave a response, or trackback from your own site.